This handheld 3-axis digital stabilized camera gimbal is so advanced, it redefines the possibilities for camera movement. The heart of the gimbal is Freefly’s proprietary high performance IMU and brushless direct drive system. Majestic Mode allows for a single operator to intuitively control the pointing of the gimbal by moving the handles without compromising the stabilization of the image. 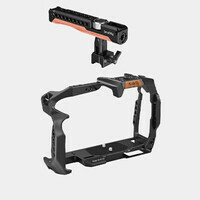 The gimbal takes the operator's movements and intelligently converts them into stabilized pan and tilt movements. This allows for very low profile single operator setup and accurate framing in tight situations.